Canadian-born American television personality Monty Hall has used his celebrity to call attention to and raise millions of dollars for Jewish and secular causes. A great deal of his charitable activity is centered on sports. The long-time Beverly Hills resident has been a moving force in the establishment and continuing development of the Israel Tennis Centers, based in Ramat Hasharon and situated at thirteen other locations throughout the State of Israel. Since 1972, the annual Monty Hall Tennis Tournament has benefited the Children’s Diabetes Center at Cedars-Sinai Hospital in Los Angeles. From 1985 to 1997, proceeds of the annual Monty Hall Golf Classic benefited youngsters participating in the World Maccabiah Games in Israel. Monty was master of ceremonies for three of the first four Southern California Jewish Sports Hall of Fame induction dinners, including the inaugural event in 1989. 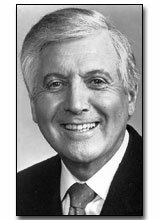 There is scarcely a major Jewish organization that has not honored Monty Hall for his voluntary efforts to assist them on achieving their goals. In addition to his countless contributions to the Jewish community, Hall has also aided charitable and nonprofit activities throughout the world, primarily through Variety Clubs.